This past weekend Julie and I took the boat down to Fairview Beach for Aquapalooza 2008. The ride down was uneventful and took us just over an hour even with a pretty good head wind. Once there we realized right away why this event is called the biggest water party in the world. There were boats and people as far as the eye could see… it was truly unbelievable! There was a floating barge just off the beach which was used as a 2 story performance platform for the 7 different bands that played the event. 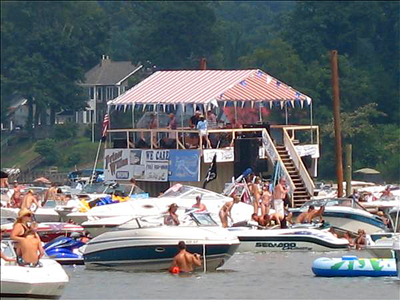 Oh yeah… you would think that being a big boating event they would have played some Jimmy Buffett or something right!? Wrong… the music was all country which really kind of sucked. I don’t mind country music, but it’s normally associated with rednecks… I’ll let you drawl your own conclusions! 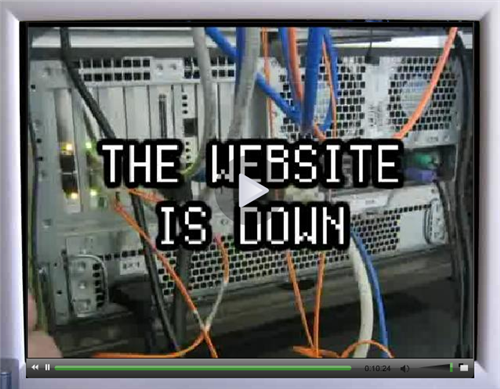 My brother just sent me a link to a Website that features a home made video called “Sales Guy vs. Web Dude”. The video is about 10 and a half minutes long, but it is well worth watching! Even if your not an IT person you’ll still get a huge laugh out of this one. According to the guys blog, he’s had over 1 million views of this video so far…!! Check it out and make sure you have your speakers turned on!! Stay tuned… more videos to follow! WordPress v2.6 was just released a couple of days ago, and as a result the auto-update feature in my online journal has prompted me to upgrade. I always get a little nervous about making big changes to server side applications where PHP code is concerned! This is partly because I’ve had issues in the past with these ‘simple’ upgrades crashing my online journal. Most of the time it happens because of a third party plug-in that doesn’t play well with the newer versions of WordPress. Regardless I always backup my files and take a quick look at the new code before I do anything. Don’t get me wrong… I think WordPress Rocks!! I’ve been using the application on my server since the first part of 2006 with very little in the way of problems (that is after the first 3 months of modifying the code to fit my needs and look of my Website!) So now it’s all about making sure that I don’t accidentally over-write one of the PHP scripts which I modified in the first place. When upgrading WP it asks you to overwrite the entire directory with the newly downloaded directory. The entire application consists of over 300 different PHP scripts, so you really have to remember which ones you modified and protect them from the overwriting process. This past weekend we traveled to Charlotte NC to help celebrate the long awaited wedding of our good friends Alice & Carl! Julie and I planned to attend the wedding on Friday evening and then spend all day Saturday in downtown Charlotte doing the ‘tourist’ thing before flying back to DC Saturday night. The wedding ceremony, which was set to begin at 7pm sharp, was held outside on a large patio overlooking a small sunlit forest. It was a little on the warm side, but the slight breeze and covered patio made it much easier on the guests. 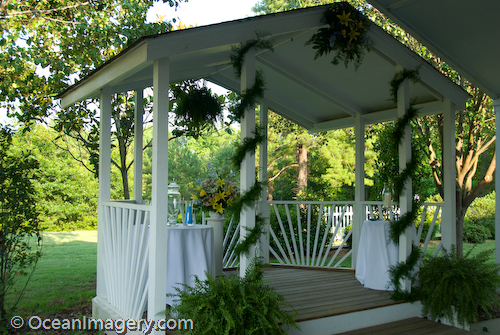 The beautiful natural backdrop was perfect for an outdoor wedding and made the event very pleasing to the eyes! 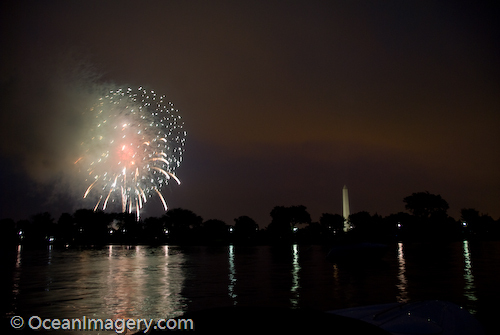 July 4th In Washington, DC! I must admit, at first I was a little nervous about taking the boat up to DC and spending the night on the river for the 4th of July. After seeing how bad the boating traffic was last year in DC and hearing the horror stories of banged up hulls from other boaters we almost didn’t go. 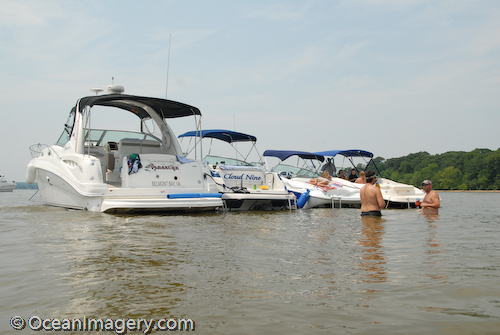 One friend of ours told us how he and other anchored boaters had to stand out on their bows and wave other boaters off with flash lights during the frantic rush to leave after the fireworks. Sounds like fun doesn’t it?! The group anchored at Belmont Bay before making the trip up to DC. 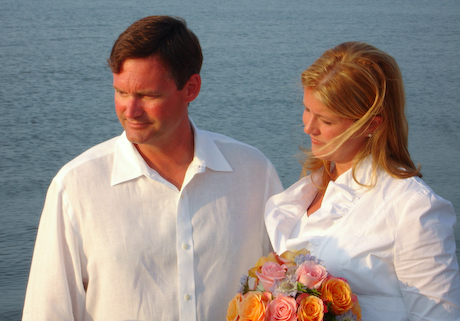 Christina & Colin exchanging wedding vows on the beach! Julie and I just wanted to congratulate our good friends Christina and Colin on their wedding last month. It was a small family only wedding, so I don’t have any photos to share, but Christina did email us one photo that she said I could use for this post. We hope that you have long and healthy lives together and wish you both all the happiness in the world!! Congratulations to you both and have a great honeymoon! !